Transnational Institute: It was just a montage of words uttered over a video in the summer of 2018. Soon the words went viral. They helped unseat a Wall St-friendly Democrat – one primed to be the next Congressional leader. They were uttered by Alexandria Ocasio-Cortez: "This race is about people vs money. We’ve got people. They’ve got money. A New York for the many is possible. It doesn’t take a hundred years to do this. It takes political courage." The big idea, her hard work and courage were all that was needed to harness latent power: the power of the people of the Bronx. Her story will underpin the theme that follows. Citizens’ latent and untapped power in countries with sound taxation systems to hold financial elites to account – and implement a Green New Deal. It can be used to transform the balance of power between the people and the private finance sector. It is power that lies in abeyance, repressed by the dominant moneyed class. But suppressed also by the narrow, myopic view that we, and our politicians, have of the potential economic power of citizens. The bank bailouts after the Great Financial Crisis demonstrated that citizens and their publicly financed institutions have the power to protect capitalism’s rentiers from the discipline of the ‘free market’. Thanks to the backing and firepower provided by millions of honest, taxpaying citizens, central banks deployed immense financial power and bailed out the globalised banking system – stemming a cascade of debt deleveraging that could have contracted the money supply, credit, and economic activity and deepened the crisis. Thanks to taxpayers, central bankers prevented another Great Depression. It was a great power deployed in the name of citizens, but without their authority – or even their knowledge. To grasp and deploy this financial power in the interests of society and the ecosystem, citizens need to understand that this was and is ultimately ourpower. It is latent power, not used by citizens to defend the public interest, but by technocrats to defend the interests of private wealth. Private bankers can only create new money and operate effectively as part of the monetary system, which includes a central bank. While commercial bankers can digitally create new money at the bidding of a borrower, they cannot print currency or mint coins. Only the central bank can do that. The central bank’s great power is to issue the currency – sterling or the dollar or the rupee –in which new money is created. And to help determine the value of the currency. That power can be exercised by central banks only because of the collateral backing the currency they create. That collateral is made up of citizens’ tax revenues. The more taxpayers that back the currency, the sounder the tax-collection system, the greater the value of the currency. Even worse, due to the absence or weakness of public institutions, Malawi is reliant on other people’s money obtained via other monetary systems. Access to foreign monetary systems mostly takes the form of loans in dollars, sterling or yen – that are heavily conditional. While some of the money may benefit the Malawian people, the cost of repayment to foreign financial institutions invariably takes its toll on the nation’s financial resources, its human and ecological assets. Regrettably the IMF and World Bank actively discourage low-income countries from investing in the vital public institutions essential to a sound monetary system – one that would restore their financial and economic autonomy. Citizens in countries with sound monetary institutions and a tax-collection system enjoy considerable potential power and agency over the globalised financial system. To understand the duration of taxpayer power, it helps to look back at the history of the British financial system. Back in 1748 the British government issued perpetual bonds, which were debts with no maturity date for repayment, but which paid interest to lenders at 3 per cent each year. The government had no difficulty selling these bonds (known as consols to the public. Public confidence – that the British government would fulfil its obligations to pay interest on the loans in perpetuity was high. That confidence was justified, as interest was paid on the bonds each year until finally they were redeemed in 2015. Ambitious and manipulative Becky Sharp in Thackeray’s classic nineteenth-century UK satirical novel Vanity Fair wished that she could "exchange my position in society and all my relations for a snug sum in the Three Per Cent Consols…for so it was [wrote Thackeray] that Becky felt the Vanity of human affairs, and it was in those securities that she would have liked to cast anchor." Becky’s envy derived from the security granted to those with funds enough to invest in the British government’s debt – known then, and for several centuries, as Three Per Cent Consols (shorthand for Consolidated debt). On an inheritance of £10,000 wealthy young women of the nineteenth century could live on the tidy sum of £300 a year; £25,000 would generate a comfortable £750 a year. Why did that matter? Because the value of sub-prime assets (mortgages) had been used to leverage inordinate amounts of additional finance through borrowing. If the asset or collateral against which the borrowing had been leveraged was worthless – then the leveraged debt was unlikely to be repaid from the sale of the promised sub-prime collateral. The collapse of confidence in asset values (or collateral) led to the collapse of the globalised financial system. Central banks used the collateral power provided by citizens to leverage vast amounts of central bank money – about $16 trillion – to bail out the global banking system. To fully understand the power wielded by central bankers, it is important to understand that each time the government applies for a loan, or issues a bond, it creates a debt – or liability – for the government. At the same time, by borrowing, the government creates a valuable financia asset for the private sector. Governments regularly (once or twice a month) invite pension funds, insurance companies and other private financiers to finance their bonds or loans, in exchange for promises to pay interest annually, and to repay the principal in full at the end of the term of the loan (bond). This process is in effect no different from a woman seeking a mortgage. She invites a banker to accept her ‘bond’ or promise to repay in exchange for new finance, backs this up with collateral, and commits to pay interest annually and the principal in full at the end of the loan’s term. Governments raise finance from both the private finance sector, or from a central bank, in just the same way as an ordinary borrower raises money from a commercial bank. The government promises to pay interest, and offers collateral. The difference between a government’s bond and the woman’s mortgage is that a bond issued by a government with a good record of repayment is a more valuable asset. As such it serves as vital collateral (or ‘plumbing’) for the private financial system. The woman’s mortgage is also an asset, but will be less valuable because she may not have established a good credit record, and may be backed by just one income (her own). The government by contrast, is backed by a revenue stream from millions of taxpayers. That explains why government bonds (or government debt) are extremely valuable assets for the private finance sector. They are safe and reliable. They generate income (interest payments) on a regular basis. Debt as a security or asset can be used to borrow (or leverage) additional finance. At the time of its bankruptcy Lehman Brothers was said to have a leverage ratio of 44. That’s like having an asset that earns £10,000 a year, and then taking out a £440,000 loan secured against it, to go on a gambling spree. According to the Bank for International Settlements, Wall St’s investment banks started with a leverage ratio of 22 in 1990, which rose to the dizzy height of 48 at the peak. There is another aspect to safe, public collateral not widely understood. That is how it is used in the shadow banking system – the private financial system that operates in the financial ‘stratosphere’, beyond the reach of states and regulatory democracy. Non-regulated bank-like entities that have scooped up the world’s savings (e.g. asset management funds, pension funds, insurance companies) hold vast quantities of cash. BlackRock for example, has $6 trillion in assets. These sums cannot safely be deposited in a traditional bank, where only a limited amount is guaranteed by governments. So to protect the value of the cash, the asset management fund will, for example, make a temporary loan of cash to another in need of it, in exchange for, or guaranteed by, collateral. This exchange is known as a repo or repurchase arrangement. The risks of this unregulated market for the global financial system, are scary. One reason is that while someone operating in the real world, say a homeowner, may only once be able to re-mortgage her asset or property, unregulated shadow bankers can use a single unit of collateral to re-leverage a number of times. Manmohan Singh of the IMF has estimated that by late 2007 collateral ‘churned,’ or was used roughly three times to leverage additional borrowing in speculative markets. That’s like using the value of a single asset – one’s property – to guarantee additional borrowing from three different banks. In the real world of financial regulation, homeowners are not allowed to do this. If we are to understand the history of how the rich have become immensely, grotesquely richer on unearned income, while earned income has fallen in real terms, leverage ratios against public assets in the both the real and shadow banking sectors explain a great deal. In short, the ability to regularly drain a government of interest payments, and to use the asset of public debt to leverage additional finance, is why asset management firms, private equity corporations, insurance companies, pension funds and financial speculators have massively increased their capital gains. It is also why secure government debt is in such demand. Private financiers can’t get enough safe government bonds – or public debt. The Great Financial Crisis (GFC) triggered a flight away from private debt and to the safety of public debt – especially the safest – British, European and US debt. This huge financial shock of the GFC led to a massive contraction of the global money supply, and threatened deflation – a generalised fall in prices – which would in turn lead to bankruptcies, unemployment and wage cuts. As a result of the panicky demand for public debt, the price of government bonds rose, and because of the way the bond market operates, the yield (‘interest rate’) on bonds fell dramatically. Demand for public debt, greatly eased government borrowing (interest) costs. Pretty soon though, politicians and officials in government treasuries, cheered on by orthodox economists, right-wing think tanks and the media, soon fell back on neoliberal or ordoliberal theory, and imposed fiscal contraction – or austerity. Public investment – government spending – was either slashed or prevented from rising. These double standards –the expansion of finance for the private finance sector, and contraction for the public sector – are intrinsic to orthodox economics, but seldom challenged by the economics profession. As a result the production of government collateral (public debt) fell. Guilt, sin and the public debt are deeply intertwined, but only in the minds of economists, journalists and the public. Debt becomes something quite different in the minds of financiers and rentiers. To Wall St. and the City of London, the safe public debt of Britain, Europe and the US is a truly awesome and even phenomenal gift. They cannot get enough of it. Until we fully grasp the importance of public debt to the finance sector, immensely wealthy, globalised corporations will continue to parasitically extract rent from public assets; inequality worldwide will continue to widen; and we, the many, will become relatively poorer and powerless. When enough of us do come to understand this latent power, we will discover that another world really is possible. The ‘timid mouse’ that is the private finance sector cannot operate without the protection of the ‘roaring lion’ that is the public sector, to quoteMariana Mazzucato. These failures weakened the ability of the left to argue that at a time of catastrophic private economic failure, public investment in jobs was essential to restore social, political and economic stability. Instead taxpayer-backed subsidies and assets were deployed by central banks via QE to protect private profits and capital gains. No wonder the public revolted. A first in the many steps that must be taken to transform the economy is understanding. People cannot act to transform what they do not understand. Understanding how taxpayers guarantee and endorse the activities of the globalised, deregulated private financial sector, must be more widespread. Only then can we begin to demand ‘terms and conditions’ for public subsidies and guarantees – and to use that power to regulate and subordinate the globalised financial sector to the interests of society as a whole. To demand that public financial assets be used for public, not private benefit. This understanding is fundamental if we are to respond to the greatest security threat facing humanity: climate breakdown. Armed with understanding, we will then need a plan. The Green New Deal is such a plan. Back in 1933, President Franklin D. Roosevelt’s plan – the New Deal - found money to fight a war against unemployment and poverty. His administration did so by overturning neoliberal economics, and implementing Keynesian monetary theory and policies. By ensuring that the monetary and financial system was managed by public, not private authority, his government raised the financing needed to lead the US out of the economic catastrophe of the Great Depression. Roosevelt’s New Deal not only created jobs and generated national income. It also tackled the ecological catastrophe that was The Dust Bowl . 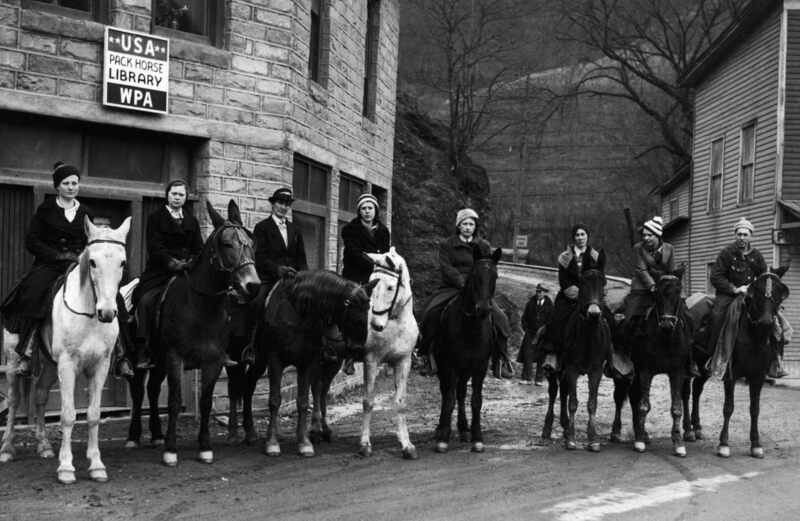 WPA packhorse librarians, ready to deliver books to remote rural areas in Kentucky, 1938. Photo courtesy of the National Archives. Any international movement for a Green New Deal will have to summon up the same political courage in countries around the world. 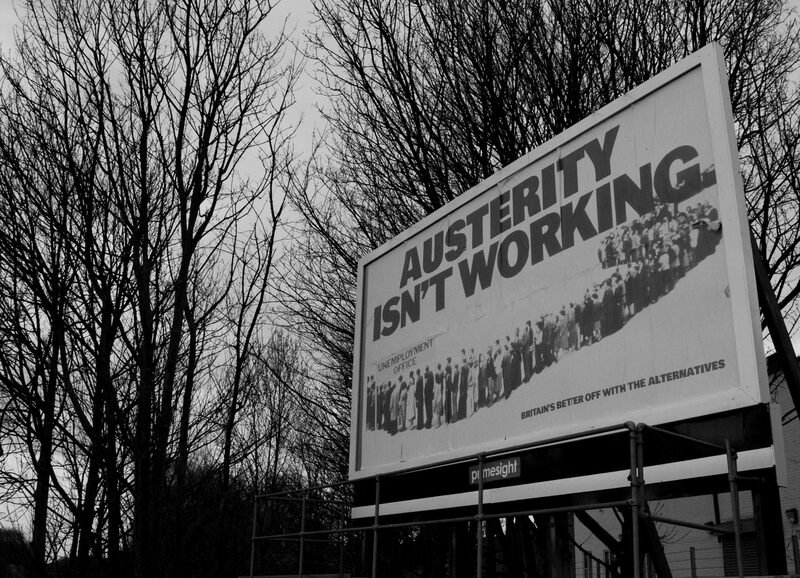 Campaigners will have to mobilise, organise and act to renounce the economic ideology that allows the 1% to grow fantastically rich on taxpayer-backed subsidies, bailouts and guarantees – while denying financial resources for public investment, economic and ecological transformation. Campaigners will have to discover, and then deploy, their latent power to subordinate global finance to the interests of society and the ecosystem.